Right pneumonectomy is not a frequent major resection in thoracic surgery, with limited indications. In some cases, it may require complex surgery. For this reason we think uniportal VATS right pneumonectomy should only be performed in centers that are experienced in uniportal resections. In this chapter the surgical technique is well defined step by step, making feasible the removal of the whole lung and putting special attention to the most critical points such us the dissection of the main pulmonary artery. We consider that the main key points for this surgery are the adequate patient selection (assessment of respiratory and cardiac function, evaluation of comorbidities) and a good planning of the surgical resection (tumour size and localization, tumour relation with hilar structures). This procedure maintains the uniportal approach advantages, not only during the surgery (direct view to the hilar vessels and tissue) but the patient recovery as well (less pain, early mobilization and reduced hospital stay). 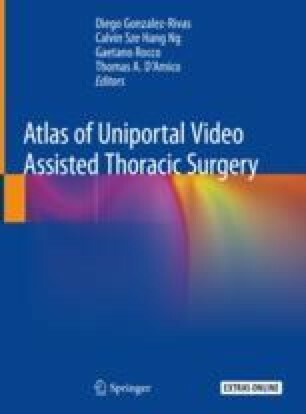 In our experience, Uniportal VATS right pneumonectomy can be considered a feasible and safe procedure. The online version of this chapter ( https://doi.org/10.1007/978-981-13-2604-2_27) contains supplementary material, which is available to authorized users.